Edulantern.com - In order to promote international cooperation, particularly with Developing Countries, the University of Pavia and the Institute for University Studies (EDiSU) offer about ten scholarships yearly for a four to ten week stay in Pavia, during which time the scholars carry out research with professors in the department that hosts them and often hold seminars. In order to encourage contact between staff and students, the period of stay should take place within the following dates: Januari 14 - July 21, 2019 and September 16 - December 20, 2019. The scholarship provides travel (economy class), food and accommodation expenses, health insurance policy and a contribution of 150,00 Euro (gross) per week. 1. Applicants must have at least two years of either teaching experience or activity within international organisations and institutions. 2. Scholarships are designed for both junior and senior members of Universities in Developing Country or members of major research centres and international organisations or institutions with specific interest in the field of development studies. 3. Scholarships are reserved for research collaboration in the short term in order to encourage the mobility of researchers from developing countries. Applicants enrolled in a Doctoral or Postgraduate Course at an Italian University are not eligible to apply. 1. The scientific relevance of the proposed project, especially when integrated with similar projects developed by the University of Pavia. 2. The Curriculum Vitae of the candidate. 3. The fair distribution of grants between the department involved and the geographical regions of origin of the applicants. Please note that application of CICOPS Scholarships 2019 is completely online. Required documents above should be uploaded to the online form. Please only fill in your application form once you have received the letter of acceptance by contact Professor at the University of Pavia. A decision will be made by June 30, 2018 by a Committee composed of the President of CICOPS and another two members designated by the Rector. 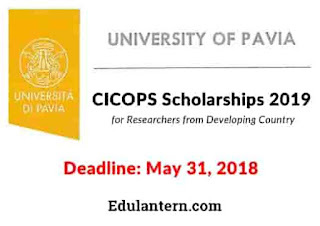 Thanks for reading CICOPS Scholarships 2019 at University of Pavia, Italy for Researchers from Developing Country. Please share...!